ISU President Wendy Wintersteen, left, gets a tour of the REACTOR Lab from InTrans Associate Director Neal Hawkins, right. 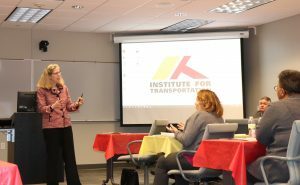 Iowa State University President Wendy Wintersteen made a recent stop at the Institute for Transportation (InTrans) to learn more about its research and its partnerships. Wintersteen, who was named ISU’s 16th president a year ago, received a short tour of InTrans facilities, before InTrans Director Shauna Hallmark offered more details during a presentation. InTrans Director Shauna Hallmark, center, has a discussion with ISU President Wendy Wintersteen after a tour of the institute. The president concluded her visit by offering brief remarks and then asking to hear from faculty and staff at InTrans about their needs and wishes for Iowa State. Wintersteen told the group gathered to hear her talk that she was “very impressed” with the organization, and “pleased” to learn more about InTrans. “One of my priorities for the coming year is that we do more through our creativity to enhance the stature of Iowa State’s national reputation, and we have opportunities to do that through the work here at InTrans and through some other efforts,” Wintersteen told the group. The visit was also a welcome one for InTrans leaders. 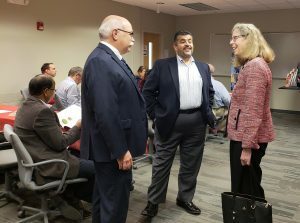 Iowa DOT’s John Selmer, left, and CTRE Director Omar Smadi, center, talk to ISU President Wendy Wintersteen about the partnership between InTrans and the Iowa DOT. Aside from InTrans leaders sharing that story, InTrans’ partners in industry and other agencies told Wintersteen about the value of the relationship they’ve formed here.